Today we’re all about that Pure Prairie Spirit at Power Poppy....its that zest for life, full of vibrant sunshine, and it comes to you a little untamed. This new set from Marcy takes its cues from an earlier release of Pure Prairie Bouquet in digital form. So many of you asked for it to be released in polymer, and now it is! 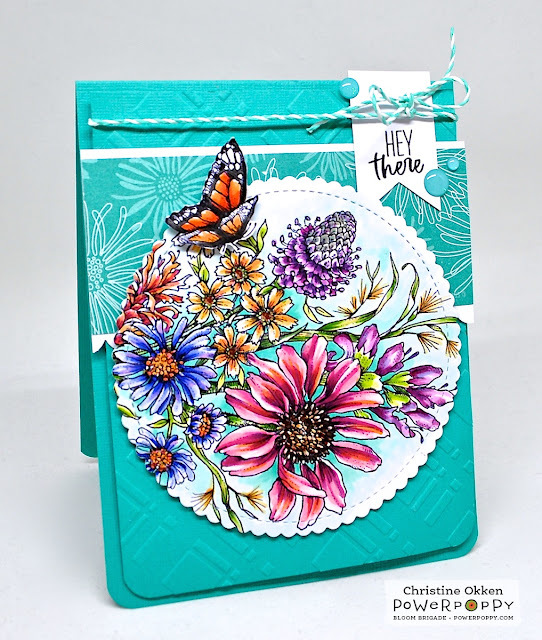 What’s fun is that you can use the monarch butterflies in the set wherever you want and there’s a new bunch of lovely sentiments as well. 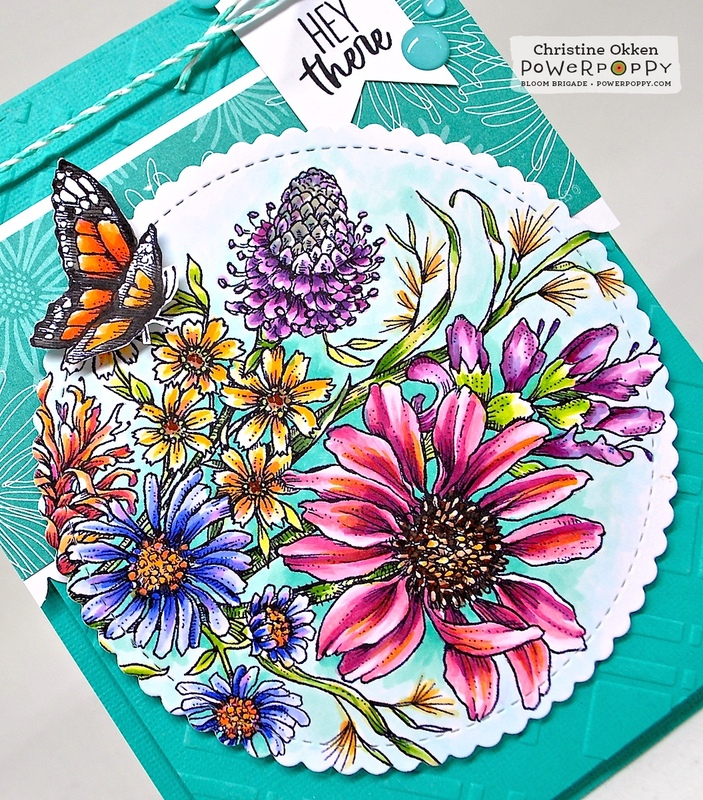 The little collection of flowers features a mix of wildflower favorites such as coneflower, New England asters, tickseed, little bluestem, purple prairie clover, bee balm, and Indian paintbrush. This pretty bouquet is so full of pizazz that I had a hard time deciding what colours to use for my paper choices. Then when I placed it on this turquoise background which mimics the colours I used to colour the background, the image really popped. I die cut the image into a circle to really fill the frame and then added some plaid embossing to the background, some designer paper that really goes with the biggest coneflower bloom, and finished it off with some enamel dots and twine. That cute little sentiment is perfect for one of those “anytime” cards. Here’s a quick peek that’s closer. I added the butterfly popped up on a foam dot. I used about 50 Copic markers for this one, so I didn’t take a picture, sorry! What you will hopefully be able to see is that I used a lot of the colours from each flower, in the other flowers. That way it ties the colouring together a bit. The Bloomies are all back in action again today to show off their Pure Prairie Spirit! and see what Marcy has to say at the Power Poppy Blog! See you back here tomorrow! Stay tuned for news about an awesome Abundance Promotion Marcy’s starting on Release Day! So pretty. Love all the different colours. I love mixed bouquets and yours in the rich colors make it all the lovelier. You've outdone yourself here...I am mesmerized by your coloring as always!! So beautiful and the teal is the perfect backdrop! Love that this stamp is so big and, of course, you did a beautiful job showcasing it. Lovely design and colors. Another must have! The turquoise was the perfect choice! Your image look like it's glowing because the card base makes the colors stand out so much! Beautiful, I love the dimension with the butterfly too, excellent coloring!